This is ‘last meal’ stuff right here! The mighty Buffalo Wing made famous by a pub in the US! The dude that decided that he would not throw away the simple chicken wing but would instead turn it into a jugernaut of the Dinners, Drive-Ins and Dives world needs to be given a medal! Chicken wings are messy, they need to be messy. If you sit up from a bowl of chicken wings and your face and hands are clean then there is something deeply wrong! Now, I have had some really bad wings in my time and it’s heart breaking because these beauties are nearly impossible to get wrong! The problem is they are usually overcooked and it happens because some places are just lazy and pre-cook them before the evening rush – bad idea! Have a crack at these bad boys – they ain’t healthy, but they ain’t meant to be. Kick off by jointing the wings, loose the wing tip and separate into drummer and winglette. Do this with all of your wings then sling them into a big bow. To make the marinade simply combine the ingredients and pour over the wings, stab the wings with a couple of sharp skewers to get the marinade right into the meat. Cling and sling in the fridge for 2 hours. Next get the sauce together – simply combine all of the ingredients and leave in a big steal bowl – set to one side – but not in the fridge (you don’t want the butter to harden). When you are ready to get the wings on – heat up a deep pan or wok with veg oil, get it up to about 180/190c then deep fry the wings in batches of 5. The wings will take about 4-5 minutes but cut into them to make 100% sure. 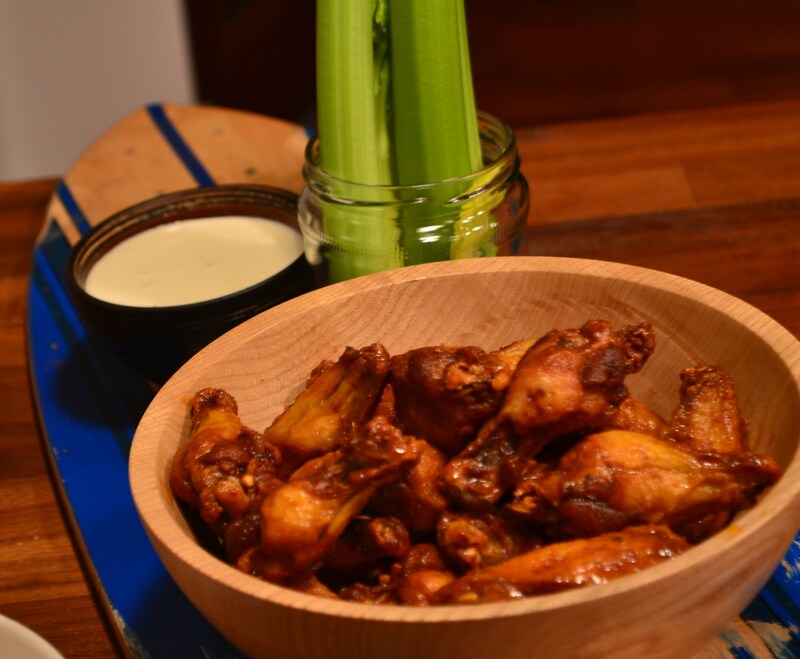 To serve simply dump the cooked wings into the sauce, toss really well and slip out into a serving bowl. That’s it – done deal, you should get a huge bang from the vinegar and when you taste the wings you should get a sweet, sour and spicy smack that is soothed with the butter and the fat from the chicken skin.